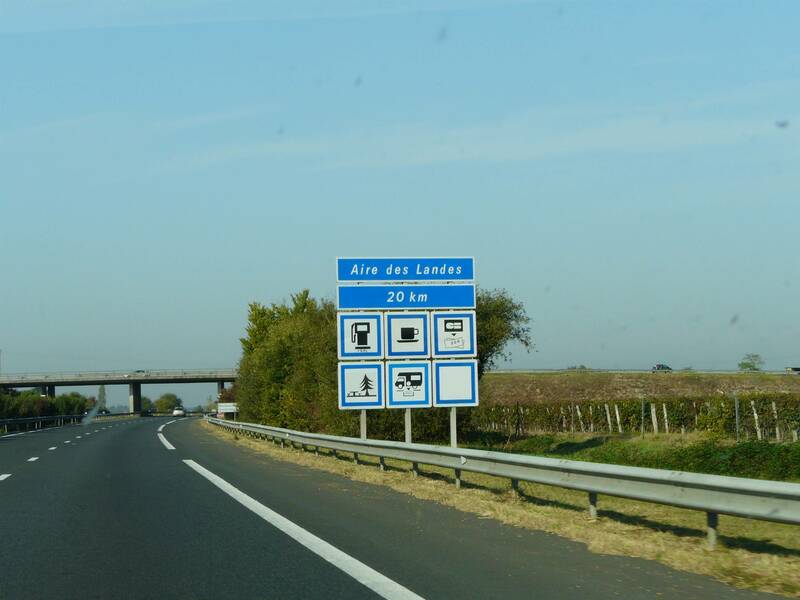 I'm planning to drive from Caen to south of Poitiers. Just wanted to figure out where convenient rest areas (aires) with cafe or restaurant facilities are on the route. So far I've completely failed to find any online maps that help find these rest areas, let alone ones that differentiate the simple parking areas from those with more facilities. This question has a really nice answer linking to a website that purports to do exactly this, however no matter what selection I make (restaurant or petrol or toilets or any combination thereof) it shows the route and say no services match my criteria. Anyone got any clues about how to find this information efficiently? The interactive map displayed can display various informations, including aires. TL;DR: There's normally no planning needed, the aires are sufficiently close together that you can start searching when you need one and get to a suitable one within 10 min/20 min assuming you're not caught in traffic jams (a real possibility during school holidays, look-up predictions beforehand if you travel Friday-Sunday). "aire de service" are rest areas with parking space, generally some picnic tables, a petrol station and the station building also generally hosts a little shop (with a toilet inside) and even sometimes multiple shops and a "restaurant"
Both categories of "aire" alternate, and it is entirely feasible to only use "aire de service" which are much more comfortable (and correspondingly generally more crowded). Being less "friendly" though, they are generally not as crowded, so if time is of the essence they will allow a more speedy "pit stop". It depends which level of comfort you wish for. On the other hand, toilets in shops are heated, generally quite clean (as it reflects on the shop's image) and generally have toilet paper and something to dry your hands with (after using warm/hot water). They may slightly less clean or not have TP during rush hours. The shops that come with gas pumps also offer a typical "mini-market" assortment of canned drinks, coffee machines, prepared food (sandwiches, salads, cookies, sweets) as well as various utilities at the very least. They may have, as mentioned, a restaurant for hot meals. Since a couple years now, some of the supermarket brands have acquired a few of the aires (E. Leclerc, Carrefour, Auchan, ...) whereas only petrol brands had stations before (Total, Esso, ...). The supermarket ones are supposed to offer cheaper gas and services, but I've not found the difference that impressive to be honest: the prices remain much higher that what you'll find outside the autoroute anyway. So, how do you pick where to stop? Below the name and distance, you can find a collection of pictograms. Not the answer you're looking for? Browse other questions tagged france road-trips restaurants cafes or ask your own question. On a long drive in France are there places to shower and securely park my car?